Thank you so much for all your lovely congratulatory messages for Flowerona’s 5th birthday! And many thanks too to all the people who’ve already completed the survey. 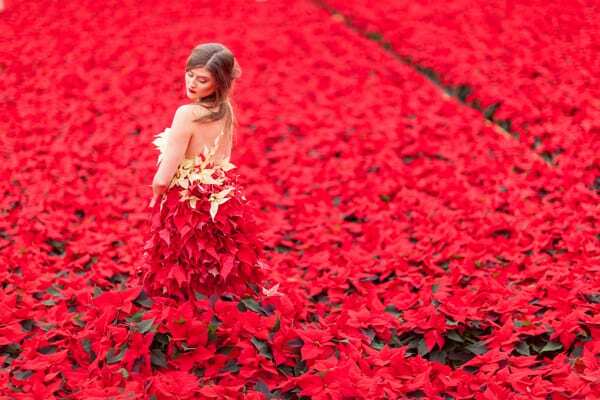 Today, I’d also like to share with you breath-taking images of a sensational floral dress made from a very festive bloom…the poinsettia! 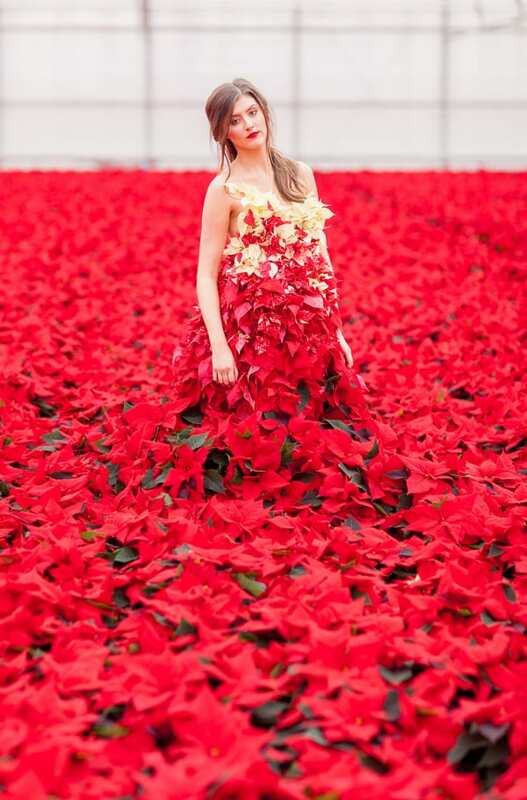 Jessica Simmonds of Okishima & Simmonds created this stunning gown of fresh, cut poinsettia in a haute couture celebration of International Poinsettia Day, which takes places this Saturday, 12th December. 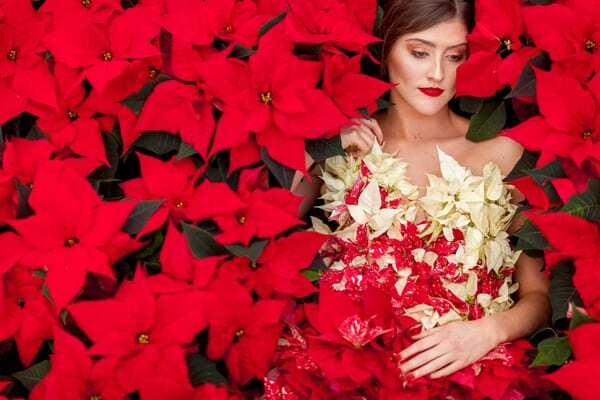 Creatively merging the worlds of flowers and fashion in new and innovative ways is fast becoming a trademark of Okishima & Simmonds, who were commissioned by Stars for Europe on the poinsettia project. 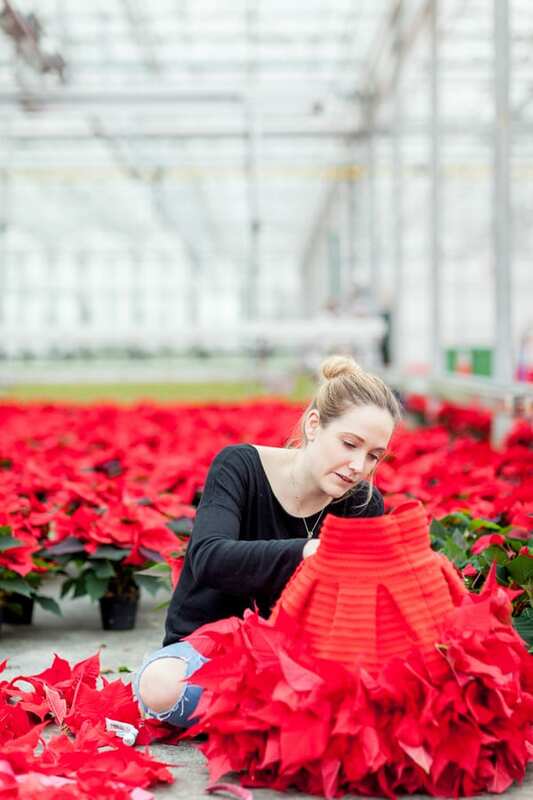 The lake of fire-red poinsettias appears to grow up and into the ombré dress, modelled by Tara Francis-Smith. It then graduates into the bodice of the variegated Poinsettia ‘Feelings Glitter’ and to a neckline of Poinsettia ‘Feelings White’. 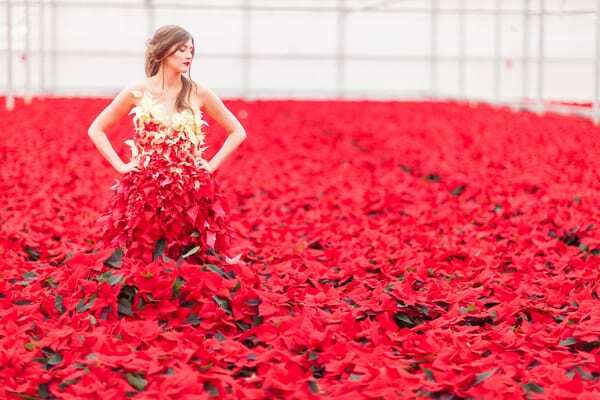 The setting was the vast poinsettia glasshouses of Hill Brothers in Chichester, where the nursery grows 500,000 poinsettia plants a year. Jessica attached the red bracts directly onto an underskirt with floral adhesive glue to create the full skirt of the dress. Each of the 350 poinsettia leaf bracts (the flowers are just the tiny berries at the end of every leaf bract) were cut short and the stems seared to stop the flow of the milky euphorbia sap. To do this, the cut stems were dipped in hot water at 60?C for 20 seconds and then into cold water for 10 seconds, before being glued to the dress. Out of water for the photoshoot, the flowers lasted for over 5 hours. 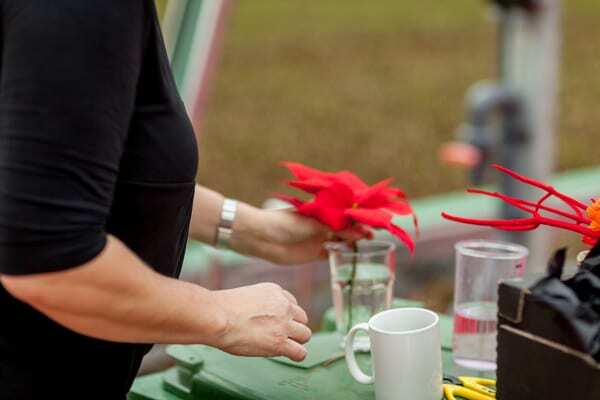 In water, cut poinsettia will last for up to two weeks. The smaller leaf bracts of the variegated and white poinsettia were secured in place with gold reel wire to form the fitted bodice, whilst the individual white leaves around the neckline were placed directly against the model’s skin. So, I hope you’ve enjoyed this wonderful insight into the making of this spectacular dress. Huge congratulations to Jessica on its creation!